Shane Grammer, an artist from Chico, is painting murals in Paradise since the Camp Fire devastated the community in November, a project he says finds beauty among the ashes. Grammer did his first mural in Paradise on December 31, a painting on Clark Road that went viral. He painted the mural on a friend’s chimney on Clark Road, a street many people drive on while driving through the Town of Paradise. The mural on Shane Edward’s charred fireplace on Clark Road in Paradise. Grammer lives in Los Angeles, but the Disney artist and father of three knew he had to make another trip up to Paradise after the response he got from the first mural. “I’ve always had this deep heart to bring hope and joy through my art with deep and destructive issues,” Grammer says. “When the first mural on Clark Road moved so many people in this community emotionally I knew I had to come back up,” Grammer added. This time, his trip and all of his supplies were paid for thanks to the generosity of Hughey Phillips L.L.P, a law firm. They paid for the costs of production, paint supplies, food and shelter for the week. He was also accompanied by a photographer that documented his work, Terence Duffy. “I paint that mural there [on Clark Road] because I am part of that woman, I am part of mankind. And God the Father has such a passionate love for me, for you, for us, and for Paradise,” Grammer says. He added that he is motivated by his Christian faith. Grammer has painted on chimneys, cars and continues to paint murals on places with special meaning. 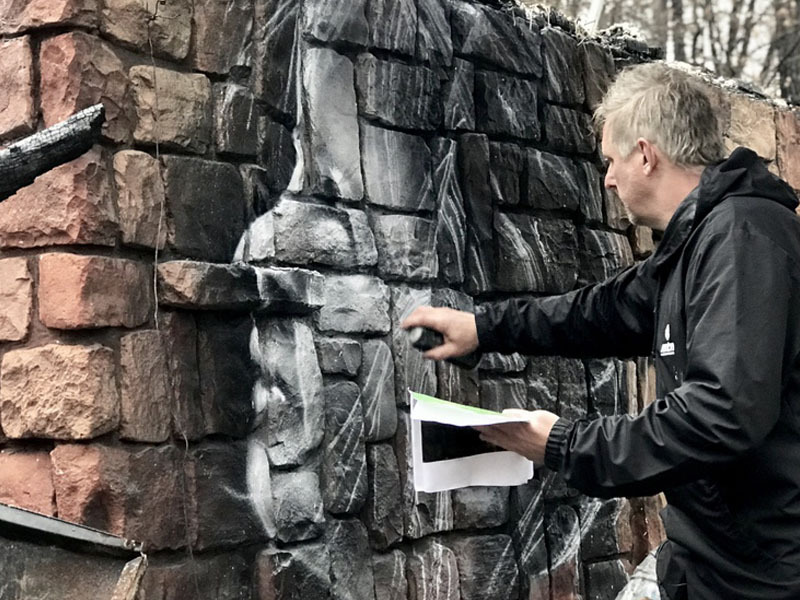 On Tuesday, Grammer painted a mural of an eight-year-old girl named Eleanor on what was left of a house on Glen Drive in Paradise. Eleanor is the daughter of a high school friend of Grammer’s. “I found a photo of Eleanor looking up towards this tree right here and the entry way of their home. A stamp that life was here and that life can continue to be here,” Grammer said. Shane Grammer painting his third mural in Paradise on Glen Drive. “She would spend hours outside playing at that corner where that tree was,” said Greg Weddig, Eleanor’s father. “She would constantly be digging in the mud. And it was right below the kitchen windows so when we were in the kitchen we could always keep an eye on her and look down at her. The tree that was there was this beautiful maple that just made everything in the kitchen red,” Weddig added. Weddig says that his home that was destroyed in the Camp Fire was Eleanor’s first home, her playhouse. He added that Eleanor has not yet been back to Paradise because she is still processing everything that happened but says the mural might encourage her to come and visit. The mural Grammer painted for Weddig was on the only wall left standing on Weddig’s home, the area where his daughter enjoyed playing. “I’m happy to be a small part of bringing hope and joy to this community and to these people who have gone through so much,” Grammer says. “People may disagree with me but there are elements of beauty in the destruction to me,” Weddig said. A mural Grammer painted on Hazel Way in Paradise. Grammer has gotten permission to paint murals on various places in Paradise. Majority of the time, the property owner is present when Grammer is doing his work. He will be in Paradise through January 18, painting various murals to symbolize beauty among the ashes in Paradise. To read more about Grammer and view his work, you can click here.